Union Agriculture and Farmers Welfare Minister, Shri Radha Mohan Singh today here addresses the 87thAGM of the ICAR Society. 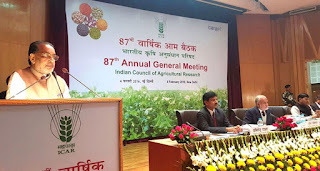 Shri Singh said that “the Indian Council of Agricultural Research (ICAR) has completed over eighty six years, overcoming challenges in growth and development of agriculture through generation of appropriate technologies that resulted in improving farm productivity, farm incomes, and building institutions, human resources, diversifying agriculture, creating new opportunities and opening up new frontiers of knowledge. The infusion of modern technologies in agriculture has undoubtedly rescued several innocent lives from claws of hungerthe ICAR is committed to overcome farm constraints to make Indian agriculture truly sustainable and profitable”. “Ministers of Agriculture, Horticulture, Animal Husbandry and Fisheries from States and distinguished Members of the Society; Members of ICAR Governing Body; my colleagues, Ministers of State, Dr Sanjeev Kumar Balyan, and Shri Kundariya; Dr Ayyappan, Secretary, DARE and DG, ICAR; Shri S.K. Singh, Additional Secretary & Financial Advisor, DARE; Shri C. Roul, Additional Secretary, DARE and Secretary, ICAR; Invitees, Senior officers of the Council, Representatives of Press and Media, Ladies and Gentlemen! I, on behalf of the ICAR and on my personal behalf, extend a warm welcome to you all in this 87thAnnual General Meeting of the ICAR Society. We are grateful to all the members of the Society and guests, who have responded to our request and travelled from all parts of the country to participate in this important annual meeting. Your keen interest and constructive suggestions, over the years, have proved to be very helpful in charting a science-led pathway for agricultural development in the country. We look forward to hear from you about the concerns relating to agriculture in your respective states and how we in the ICAR can be partners in addressing the same. The Indian Council of Agricultural Research (ICAR) has completed over eighty six years, overcoming challenges in growth and development of agriculture through generation of appropriate technologies that resulted in improving farm productivity, farm incomes, and building institutions, human resources, diversifying agriculture, creating new opportunities and opening up new frontiers of knowledge. The infusion of modern technologies in agriculture has undoubtedly rescued several innocent lives from claws of hunger. The ICAR is committed to overcome farm constraints to make Indian agriculture truly sustainable and profitable. I wish to avail this opportunity to share some of the important developments and achievements in the last year, As President of the ICAR Society. The 87th ICAR Foundation Day function of the ICAR on 25 July, 2015 was graced by Hon’ble Prime Minister of India, for the second consecutive year. In his thought provoking Address, Hon'ble Prime Minister called upon agricultural scientists and planners to design second green revolution with new vision, dimensions and objectives in light of diverse challenges in this modern era. In this context, he reiterated that second green revolution will begin from the land of eastern India which has immense potential in terms of natural resources and willing farmers to take up experiments in fields. While appreciating the agricultural scientists and farmers for their contributions and Hon. PM suggested identification of commodities having high potential of income from national and global markets. The 68th UN General Assembly declared 2015 as the International Year of Soils (IYS) for raising awareness among the people on the importance of soil in sustaining life support system on earth. Keeping this in view, Indian Council of Agricultural Research celebrated World Soil Day on 5th December, 2015 across the country. All the state governments have together distributed about 40 lakh soil health. A total of 607 Krishi Vigyan Kendras and 80 ICAR institutions/Agricultural Universities organized the function inviting Hon’ble Union Ministers, Governor, Chief Ministers, MPs, MLAs and other important persons for participation. In this event, about 2,50,000 Soil Health Cards were distributed to farmers who were also educated on use of these cards for maximizing farm productivity. I was myself at Ranchi, Jharkhand where 25,000 Soil Health Cards were distributed to farmers. I am happy to share with you that the number of mobile soil testing labs that was only 17 in the last four years has increased to 77 by December -2015 during last one and half years. ICAR celebrated ‘Jai Kisan Jai Vigyan’ Week from 23 December to 29 December 2015 on the birth anniversary of former Prime Ministers Shri Atal Bihari Vajpayee and Late Shri Chaudhary Charan Singh. The celebration was organized keeping in view their immense contribution for promoting use of science for the welfare of farmers. ICAR Institutes and KVKs across the country organized various farmer awareness programs, showcasing and demonstration of new technological advances for enhancing productivity and profitability of agriculture. Progressive farmers who have successfully adopted latest technologies and have made contribution in wide scale adoption of technologies by farmers were felicitated. During kharif 2015, unprecedented heavy infestation of whitefly on cotton was documented in Punjab and Haryana resulting in significant damage to the crop particularly in Punjab where more than 75% of the crop experienced delayed sowing due to delayed harvesting of wheat. In Haryana relatively less damage was experienced where nearly 50% cotton area was timely sown. Deficient rain fall coupled with hot, humid and cloudy weather during June-July led to severe outbreak of whitefly. We held several meetings on this issue with all the stakeholders and comprehensive strategy to prevent recurrence of the pest during next season has been planned. With an eye on the future needs of both, the agriculturalists as well as the consumers the Council has revised the mandates and formulated Vision-2050 for all its institutions including the headquarters. These steps are expected to provide useful directions to the future programmes of research and education. Building institutions of research and higher agricultural education received priority. Foundation stone of new Agricultural University in Andhra Pradesh, Horticultural Universities in Telangana, National Research Centre for Integrated Farming (NRCIF), Motihari, and Indian Agricultural Research Institute (IARI), Hazaribagh, Jharkhand, were laid and Central Agricultural University, Imphal is being strengthened with six additional colleges in north eastern states on agriculture, horticulture, veterinary sciences and food processing, thereby raising the total number of colleges from 7 to 13. We are in the process of setting up a Post Graduate Institute of Horticulture, Amritsar. The Bill for conversion of Rajendra Agricultural University, Samastipur and Bihar into a Rajendra Central Agricultural University, Pusa is introduced in the Parliament. Government is committed to promote organic farming to increase soil health. New scheme Paramparagat Krishi Vikas Yojana (PKVY) to develop organic clusters taken up from current year 2015-16. As a matter of fact, before the advent of synthetic chemical fertilsers and pesticides, organic farming formed the very basis of agriculture in India since ancient times. The soil fertility was maintained by using manures made using natural sources. During the year, the agricultural research and education institutions of the ICAR, successfully generated and introduced technologies to boost farm production and incomes. I am happy to mention that the ICAR, by the year 2015, prepared contingency plans for 600 districts in the country for addressing adverse climatic conditions including erratic monsoon. A total of 1,503 indigenous and 195 exotic collections comprising fruits, vegetables, tuber crops, plantation crops and nuts, spices, medicinal and aromatic plants, ornamental crops and mushrooms were made from different sources. Registration of seven new breeds of indigenous livestock during 2015 took the total number of registered indigenous breeds in the country to 151. A new fish species Clarias serratobrachium sp. nov. was discovered from the wetlands along Indo-Burma border. Development of improved varieties and hybrids and availability of their quality seed is the most vital and critical input for increasing the productivity of crops. During the year, 80 new improved varieties/hybrids of different field and horticultural crops were released for cultivation in diverse agro-ecological regions of the country and produced and distributed over 98,000 quintals of breeder seeds of major food crops, as well. Biofortified rice variety CR Dhan 310 was commercialized successfully in the Indo-Gangetic Plains belt and Swarna Shreya, a new rice variety for drought–prone conditions was released. For quicker spread of new technologies, demonstrations of oilseeds through KVKs have been introduced for first time in 2015-16. India remains global leader in production of milk for the last several years. Milk production increased from 137.69 Million Tonnes (MT) to 146.31 MT between 2013-14 and 2014-15 respectively. The estimated production for 2015-16 is projected at 160.35 MT, with highest annual increase of nearly 16 MT, in several years. Similarly the eggs have increased from 74 to 78 billion registering an annual growth rate of 5% and enabling 63 eggs per capita per year. In this important development the research institutions have played a crucial role. PCR assays for the detection of 17 prioritized exotic and emerging viruses were developed. FMD virus serotype O vaccine strain with enhanced thermo-stability was constructed using reverse genetic approach. Fisheries sector has recorded a very appreciable enhancement placing India at number two position among the fish producing nations. The Fish Production achieved a growth on 6.18% during 2014-15 which was 5.88% during 2013-14. Captive stocks of Rita chrysea, an indigenous catfish endemic to Mahanadi river, were successfully induced-bred in hatchery conditions. The fish has good consumer preference and market demand. For maintaining and upgrading quality and relevance of higher agricultural education, the Government has approved financial support of Rs. 2,900 crores for the 12th Plan. The support was provided for Niche Area of Excellence (28), Experiential Learning Units (21 new). The National Agricultural Science Fund, established to support basic and strategic research in agriculture, beside supporting, reviewing, monitoring and evaluation of the ongoing projects also initiated funding of new projects which were in the process of evaluation. Technology development and delivery are as important as the process of technology generation. Krishi Vigyan Kendras (KVKs) model is serving as the extension arm of the ICAR and received wide appreciation, not only in the country but abroad as well. The Government has accorded approval for Rs 3,900 crore for the continuation of the KVK scheme in the 12th Plan whereby nationwide 109 new KVKs will be established, the number of Agricultural Technology Application Research Institute (ATARI) erstwhile Zonal Project Directorates, has been increased from 8 to 11 and enhancement of KVK staff from 16 to 22. Provisions of strengthening of infrastructure at KVKs will also be made to improve the overall efficiency of technology assessment, refinement and transfer. The ICAR signed MoUs with national and internal organizations/institutions in the area of agricultural research and education.